The most important function of a cooler is insulation. If the box isn’t keeping food and drinks at an optimal temperature or allows too much heat inside, it isn’t worth your time. The best cooler also needs to be a decent size for parties or family outings. After all, if you can’t hold more than your lunch in it, why bother? The Coleman 54-Quart Steel-Belted meets both of these requirements with a solid, well-insulated build and a 54-quart carrying capacity. This cooler is a solid box with steel accents for a strong build and easy upkeep. The stainless steel latch will keep the lid secure during transportation while the steel grips make it comfortable to carry along with the rubber handles. The built-in drain also makes it simple to drain melted ice or other beverages from the cooler without tilting it over. This one is also a good choice for larger meals. The total carrying capacity is enough to hold 85 cans or several 16-ounce bottles at once. Saving some money while purchasing a new cooler means you will most likely be downsizing if you want to keep the same level of insulation. Many budget options are large enough for parties or picnics, but they may sacrifice on the build quality which diminishes insulation. Therefore, a budget cooler like the Rubbermaid Cooler 10-qt is a great option for personal meals. The budget cooler uses Rubbermaid’s standard, dependable hard-shell construction to keep everything together while in use. The double-walled construction offers multiple layers to separate the inside temperature from the outside. For walking around, the cooler’s top handle is comfortable to hold and easy to store out of the way to access the lid. At 15 x 13 x 9.5 inches, this classic-looking cooler from Igloo has a 24-can capacity that’s perfect for a long car trip, an overnight at your favorite campsite, or an afternoon at a sporting event. This cooler stands out because of its unique dimensions — the taller, narrower design makes it a perfect fit for the floor of the car (tucked neatly behind the front seat) or under the seats at a sports stadium. Most coolers tend to be short and wide with bulky latches or irregular shapes, which can make them inconvenient to transport or pack. But the Igloo Legend is about as compact and streamlined as it gets. The handle even folds flat with the cooler profile so it takes up a minimum amount of room when space in the car is tight. If you’re in the market for a smaller cooler, the price, size, and quality of the Igloo Legend will be hard to beat. Large hardshell coolers are often the best for insulation, but they take up space. The larger the box, the more space you need in your garage, basement or trunk. A good alternative is a soft cooler. Flexible and often collapsible, soft coolers offer great insulation with better storage options when not in use. You might not keep things cool quite as long as hardshell coolers, but they will still get the job done for several hours before the food is affected. The Arctic Zone Titan Deep Freeze is a top softshell choice due to its plethora of storage compartments and high-performance insulation. The Rhino-Tech exterior resists scratches and stains and will insulate small items alone in the outer pocket. Inside, you will get the benefit of hardshell insulation with the removable HardBody liner. The liner will keep the cooler rigid and sealed when you need the most insulation. Large coolers are often more economical when you need to keep a large amount of food or drinks cool for a long period of time. While you can do the same thing with several smaller coolers, the costs will quickly add up. 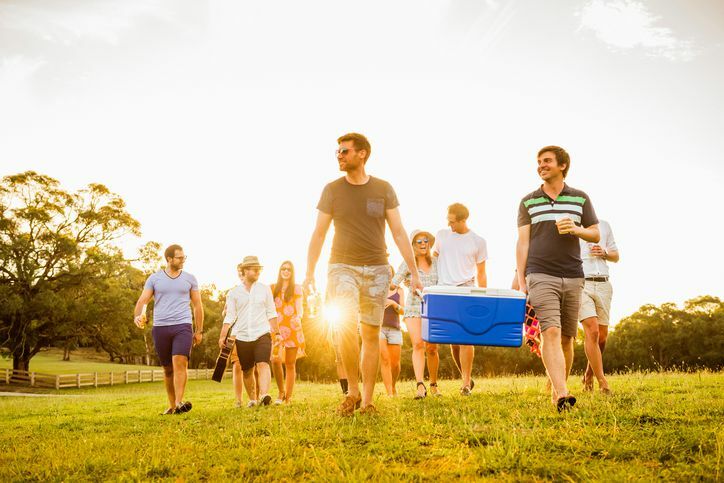 Larger coolers are also more convenient for parties and other gatherings since they keep things all in one place for guests. The Igloo 125-qt. Party Bar is one of the largest coolers out there with a capacity of 125-quarts. This large size will give you the capacity to hold 158 or 212 12 oz. cans depending on if you use the included dividers for organization. For transportation, the cooler comes with a detachable rolling base and heavy duty side handles. Along with the massive size, this cooler also provides some handy features such as LED lighting and a bottle opener. Do you have a long way to walk with your cooler before you can set it down and use it? Large coolers are heavy. Unless you have a couple of people to carry it over long distances, it can be difficult to transport it to its final location for an event. That’s why some manufacturers, like Rubbermaid, offer some options with wheels you can conveniently push or pull along for transportation. The Rubbermaid 75-qt. uses two heavy-duty wheels to take the load of the cooler during transport. The inside can hold up to 130 standard soda cans and is accessible via a split hinge door to minimize the amount of cool air lost while the door is open. On top, 12 built-in cup holders allow the cooler to double as a side table during parties or camping trips. A rugged outdoor adventure requires an equally-rugged cooler that can handle the elements — and any potential encounters with curious wildlife. That’s where the YETI Tundra 45 comes in. This thing is built like a tank, fabricated with extra-thick walls, military-grade polyester handles, and a rotomolded construction that is “virtually indestructible.” The latches are also built tough with YETI’s patented T-Rex design. And yes, the whole thing is fully bear-proof. If you’re transporting your gear by truck, trailer, or boat, the Tundra 45 has built-in tie-down slots so it can be easily secured. This cooler measures 25.5 x 16 x 15.5 inches, with three solid inches of YETI’s PermaFrost Insulation keeping the contents cool. It also has a rubber gasket around the edge of the lid for superior cold retention and protection against leaks. Att 22 pounds (when it's empty), it isn’t the lightest piece of gear. But if you need a tough-as-nails cooler with unparalleled cold retention —a must-have for a trip into the wild — then the YETI Tundra 45 fits the bill. It’s nice to have a cold lunch every now and then. Preparing your own meals and bringing food from home is often more affordable while giving you creative control over your food. The best way to keep these meals cool long enough to enjoy is with a small cooler like the CleverMade SnapBasket. This cooler outperforms other options by offering the same level of insulation as its bigger cousins. The SnapBasket is a soft, collapsible tote bag with the capacity to hold 50 cans of soda. Made of rip-stop fabric, both the exterior and interior are extremely durable and spill proof. The top grips are soft and secure when bound together. When carrying food, the bag has enough rigidity to keep contents from spilling inside or over the top. This a great option if you picnic often. Most coolers are good at keeping their contents cold for a few hours. This is enough for most occasions, but if the duration is an important consideration, you will need more. Long-term coolers require more insulation to keep temperatures down. The Igloo Quick and Cool is a top pick anytime you want a cooler for an all-day trip or party. Using a polyurethane hardshell, the Quick and Cool is well insulated for extended use. The lid sports a solid latch and quick access hatch on the top. For people looking for a drink or snack, the hatch is a perfect addition that minimizes temperature loss.